By: Clement Doleac, Research Associate for the Council On Hemispheric Affairs. Through an analysis of the relationship between the Organization of American States (OAS) and the government of Cuba, as well as the review of the importance of democratic values being upheld in the Inter-American system, this article details how the U.S. imperialism is at the roots of the political hemispheric organization. Because of the efforts of the U.S. hegemonic participation in the OAS, most Latin American governments reject the OAS as the most important forum for political discussion in the hemisphere which led to an uncertain future of the OAS. This is illustrated by Cuba’s reluctance to reintegrate into the OAS and the difficulties the OAS has had to reestablish the democratic identity that it was once known for. These difficulties have led to the creation of a set of regional forums and calls for a deep political reform of the Inter-American system. The OAS was conceived in 1948 as an organization destined to promote peace and the settlement of disputes among member states. The OAS Charter titled Pact of Bogotá signed in 1948 obliges the contracting parties to settle controversies by peaceful means such as mediation, investigation and conciliation, good offices, and arbitration. By the end of the 1940s, U.S. foreign policy began focusing on the Third World, as these peripheral countries were the new battleground of the Cold War. This shift in U.S. foreign policy is best exemplified through the Chinese Revolution and the Korean War. Additionally, certain events in Latin American, such as the apparition of the first communist guerillas, led to a change of foreign policy priorities in Washington. Hemispheric Affairs were rarely a priority to either the White House or the State Department until the 1950’s when, as the Cold War escalated. Primary resources became of rising importance, which turned Latin America into a priority due to its oil reserves as well as when the Bay of Pig was launched. Furthermore, Dwight Eisenhower’s victory to U.S. presidency led to a more aggressive approach in Latin America foreign policy. Republicans were ferocious critics of Democratic foreign policy, which was viewed as too dependent on Western Europe and not focused enough on Latin America, compared to the foreign policy objective that Republicans ideologues purposed. Hence, Washington switched gears and began working towards the goal of a new Pan-American era under U.S. hegemony. The principle of non-interference, one of the strongest basis of hemispheric affairs since the OAS charter was signed, became obsolete. Numerous mechanisms of multilateral interferences were invented in order to fight all “communist threats” throughout the will of OAS member states. The mandate of the OAS expanded as heads of state met in numerous conferences, ratifying new deals such as the “Act of Chapultepec” (1945). This Act, formalized in Rio de Janeiro, Brazil, installed the Inter-American Treaty of Reciprocal Assistance (TIAR, Tratado Inter-Americano de Asistencia Reciproca). This Treaty guaranteed the reciprocal assistance in the case of war with a non-hemispheric state. In the aftermath of World War II and as the Cold War began to loom, this military reciprocal assistance was established in order to ensure Latin American support to Washington’s foreign policy strategy against communism, in which the OAS was a primary tool of the U.S. government. At the end of the 1950s, based on the TIAR and the OAS, the United States pressed “anti-communist” coercive operations and collective measures, with tacit support of the OAS machinery. For instance, the U.S. government targeted the leftist Guatemalan President Arbenz’s economic policies, such as the nationalization of the United Fruit Company, which were seen as threats to U.S. business and security interests. The OAS did not escape the polarization of the Cold War world after the barbudos‘s victory in Cuba in 1959 and the installation of a “communist” government in North America’s “backyard”. However, Fidel Castro’s Cuba had good relations with many Latin American governments, while also condemning dictatorships in Dominican Republic, Nicaragua, Paraguay, Haiti, as did other regional democratic governments. During the Inter-American Caracas Conference in 1959, the Costa Rican President José Figueres Ferrer also purposed the exclusion of these dictatorships from the OAS in order to prove the importance of democratic values. Cuba’s attempted invasion of Panama, Nicaragua, and the Dominican Republic in order to end dictatorships led to hostility in the Inter-American system. In August 1959 during the Inter-American Summit in Santiago de Chile, the OAS adopted the Declaration of Santiago, which included a political description of a “good political regime,” which stretched “representative democracy” and the “principle of non-intervention” in order to oppose Cuba’s interference and that of the dictatorships in the Americas. In 1960, the Venezuelan government filed a claim against the Dominican Republic’s longtime strongman Rafael Trujillo because of the attempted assassination of Venezuela’s President-elect Rómulo Betancourt. These accusations were displayed at the Costa Rican Summit in San Jose in August 1960 and the TIAR mechanism was quickly implemented against the Dominican Republic. The OAS, including the U.S. Government, suspended diplomatic relations, and economic relations were suspended with the Dominican Republic. That same year, relations between Cuba and Washington was degraded because of an agrarian draft reform affecting U.S. interests, and because of the growing rapprochement between Cuba and the Union of Soviet Socialist Republics (USSR). Cuba’s government attempted to import oil from the USSR on a long-term basis but American firms in Cuba refused to refine it, leading to the expropriation of these American enterprises. The U.S. government reacted by blocking Cuban assets in the United States obtained from sugar to others commercial activities. As a riposte, the Cuban government nationalized every American enterprise on Cuban territory, and asked the United Nations (U.N.) to investigate the situation. The U.N. stated that the OAS should be the one in charge of the situation. At the end of August 1960, the Foreign Ministers of the OAS member states (except Peru and Mexico) voted in favor of a declaration, stating that the incompatibility between the Inter-American system and relationships with the USSR should be validated. The situation escalated in 1961, when the U.S. government, with diplomatic support from most Latin American governments, attempted to invade Cuba. The OAS did not oppose this incident. This is a dramatic turn on events because, as previously mentioned, there were plenty of tools that the OAS could have turned to throughout this incident. Moreover, the OAS could have acted as a negotiator between Washington and Havana. Instead, Cuba was also excluded from the Inter–American Defense Junta (Junta Interamericana de Defensa), and the OAS adopted a declaration against “the offensive of communism” in Latin America. The commerce of weapons and ammunition to Cuba was suspended as well. Since then, Cuba has considered itself excluded from the OAS. This suspension was lifted only in 2009 but Havana chose not to return. Since the 1961 Bay of Pigs Invasion, the democratic paradigm of the OAS has been successively trampled. The following year, the world stood still due to the Cuban Missile Crisis, while the region experienced several coups against democratic governments in the 1970s. The most illustrative example of the U.S. government’s support of anti-communist dictatorships was the Pinochet dictatorship in Chile (1973-1990). In order to ensure the effectiveness of the coup against the President Salvador Allende, U.S. navy boats were ordered to patrol the Chilean coast during the military coup on September 11, 1973. Moreover, the U.S. government also supported dictatorships in Argentina (1976-1983), Guatemala (1954-1986), Bolivia (1971-1978), Nicaragua (1936-1979), Haiti (1957-1971 and 1971-1986), Panama (1968-191 and 1983-1989), Brazil (1964-1985), Paraguay (1954-1989), and El Salvador (1979-1982). These dictatorships led to the murders and disappearances of thousands of people throughout the Americas. As a final example of this tragic past, we must highlight the atrocious actions carried out by South American security agencies as part of Operation Condor (1975-1985). This operation was aimed at eliminating South American leftists (whether they be guerrillas or sympathizers), and led to thousands of murders and disappearances, including 2,000 in Paraguay, 3,196 in Chile, 297 in Uruguay, 366 in Brazil, and 30,000 in Argentina, according to Brazilian journalist Nilson Mariano. However, given that many people throughout the region remain disappeared to this day, the actual death toll of Operation Condor could be much higher. It was only after two decades of dictatorships in Latin America and the end of the Cold War that the OAS was “revitalized” to promote proper democratic conduct. The creation of the Unity for the Promotion of Democracy (UPD), an OAS Department, in 1990 illustrated this new will within the OAS. The UPD was in charge of promoting democratic values in member states and protecting democracy in the Americas. Some priorities of the UPD were the technical assistance for elections, the support for legislative processes, and civic education. It also worked to facilitate peace processes in Guatemala and Nicaragua as these countries negotiated an end to their respective civil wars. Another example of deepening democratic values in the OAS is the Declaration of Santiago, adopted in 1991 by the General Assembly. The Declaration provides a set of rules and legal instruments in cases of democratic ruptures in the member states. Through this Declaration, the General Secretary can call for an urgency meeting of the Permanent Council to analyze, discuss, and eventually take measures on a specific situation. If these measures are not effective within 10 days, a special session of the General Assembly can be called upon. Before 1991, democracy was seen as a moral prescription whereas nowadays it is viewed as an international legal obligation. Continuing this approach, the Inter-American Democratic Charter was approved on September 9, 2001 in Lima by general consensus and has become the cornerstone of the Inter-American Democratic system. The charter states the obligation for governments and peoples of the Americas to promote and defend democracy as well as to create mechanisms to rule against the interruption of democracy in OAS member states. Moreover, the interruption of the democratic process can lead to the suspension of a Member State. Nevertheless, these new mechanisms are vague and the measures are from binding for the Member State of concern. In addition, in some cases, such as the crisis in Haiti in 2004, military interference is still preferred by U.S. Government, which backed Haitian ex-militaries before and during the crisis, and by inviting ex-Haitian President to leave the country. The Democratic Charter has been invoked formally two times since its ratification. The first time was in 2002 in Venezuela. An April 11 coup managed to remove President Hugo Chávez from power for several days. Coincidentally, the Heads of the Rio Group were holding a summit in Costa Rica (San Jose) when they heard about the attempted coup. They issued a joint statement on April 12 to condemn the coup and called for a special session of the organization’s General Assembly. Two days after the attempted coup, President Chávez came back in office accompanied by massive popular demonstrations. Unfortunately, in spite of the numerous legal tools at its disposal, the only response from the OAS was to issue a statement in order to condemn the destabilization of democracy. The OAS condemned the coup and violence long after the coup failed, which illustrates its weakness to defend democracy and its role like a firefighter arriving long after the fire was extinguished. Following this, then-General Secretary César Gaviria (and former Colombian President) redacted a report stretching the polarization of Venezuela and asked for a democratic dialogue between the elected government and the attempted putschists. The OAS then initiated a mission for peace and dialogue in Venezuela, which was condemned to fail from the beginning because of the political opposition in Venezuela. Chávez even called for an election before the end of his term in office, elections he won convincingly (nearly 60 percent of the vote, with a 70 percent participation rate), although the opposition refused to recognize the elections. The OAS, even after showing the will to promote democratic values, clearly failed to effectively establish a dialogue in Venezuela and helped to abate the local tensions. Similarly, the second invocation of the Democratic Charter took place during the coup against the democratically elected government in Honduras. The (brief) background on the coup is that right wing sectors and the army did not accept that the President Manuel Zelaya wanted to hold a non-binding referendum in the country against a decision of the Supreme Court stating he could not hold a binding referendum. On July 28, 2009, Roberto Micheletti led a coup against President Zelaya. The OAS member states’ refusal of the coup was unanimous: International development aid from the International Monetary Fund (IMF) and from the Inter-American Development Bank (IADB) was suspended, as well as the aid from the United States, El Salvador, Venezuela, and the European Union. Due to these measures, the country’s income was reduced by 20 percent. The OAS suspended Honduras by resorting to the Democratic Charter mechanisms. The democratic paradigm seemed, six years after the attempted coup in Venezuela, stronger. However, the more consensual approach towards the coup in Honduras can be explained by the limited diplomatic and geopolitical importance of Honduras, the second poorest country in Latin America. Such a coup led to mass protests in Honduras against the dictatorship during which 30 protesters were assassinated and 4,200 were arrested. Numerous mediations between the elected President Zelaya and dictator Micheletti were intended, but with no success. One of these failed mediations was supported by the OAS, which proved to be unsurprisingly powerless to deal with the situation. It was only in November 2009 that the right-wing political parties in Honduras chose to ally together to demand new elections in the country. Left wing parties did not participate in the election that led to a low 50 percent election participation. While the member countries of the Bolivarian Alliance for People of Our America (ALBA, Alianza Bolivariana para los Pueblos de Nuestra America) did not recognize the election, other American countries did, and Honduras was reincorporated into the OAS. These examples illustrate how well the OAS has to struggle to protect democratic principles in the Americas. However, economic and diplomatic interests remain the main reasons for the final outcome of the situations, not cozy and broad declarations out of the OAS headquarters in Washington. The Democratic Charter does not seem to allow the OAS to be an entirely useful tool to have a more important role in the development of crisis in the Americas. The local context and the international equilibrium were much more impactful on the situation. In the end, the dominant interests continue to have the greatest impact on the conflict and crisis resolutions. These instruments can even be utilized against democratic governments if the majority of member states are in favor of doing so. For example, U.S. Secretary of State John Kerry proposed to apply the Democratic Charter against the Venezuelan elected government, due to the protests in Venezuela at the beginning of 2014 (which caused nearly 50 deaths). Nevertheless, this move had more to do with souring Washington-Caracas relations than Washington’s belief that Caracas is engaged in some type of “terror campaign,” as carelessly denounced by the U.S. Secretary of State. Cuba Reintegrated in the OAS? The changing international stage also brought dramatic changes in the OAS-Cuba relationship. 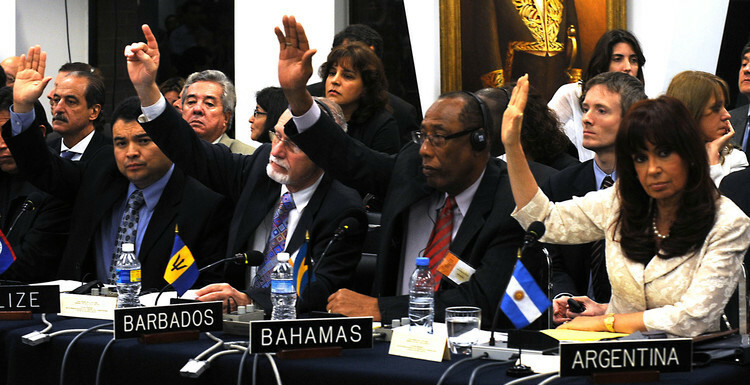 In early June 2009, the OAS approved a resolution creating a pathway for Cuba to rejoin the OAS as a member. Surprisingly, it was a U.S. resolution that was approved in Honduras (2009) that facilitated this move. At this stage, Washington faced a dilemma: Cuba remained a very specific case for Washington. It was, and remains, neither a classic dictatorship nor a Western-style democracy. The key problem for the United States was to avoid being perceived as a country neglecting its “democratic principles” and to be able to open a positive path towards Cuba’s reincorporation in the OAS at the same time. The atmosphere was tense in the previous months up until the 2009 OAS General Assembly between the U.S. government and ALBA. The latter countries wanted to avoid asking for specific actions on Cuba’s part such as to adopt the core principles of the OAS, while U.S. government wanted to condition Cuba’s return to the adoption of the full OAS instruments, such as the Democratic Charter or the Human Rights Commission. In the end, a middle ground-type of agreement was reached: Cuba’s suspension was lifted, but Cuba’s return should be done “in accordance with the established practices, purposes and principles of the OAS”. This successful negotiation between the leftist ALBA block, Caracas and Washington is a rare example of successful dialogue under the OAS umbrella. The aforementioned positive example notwithstanding, it is doubtful that the U.S. and the OAS will be able to continue down the path of mutual dialogue in the future. Even with a potentially powerful democratic charter in its toolkit, the geopolitics and the interests of some countries, specifically those of the United States and Canada (which together finance around 75 percent of the Inter-American system), will still rule the mechanism. This reality is very clear in the way the OAS managed the Venezuelan crisis in 2002 and the Honduras crisis in 2008, as well as the manner in which Secretary Kerry dealt with the Venezuelan crisis in 2014. In Honduras, the left-wing party boycotted the elections hence international mediators should have looked for another option after the electoral fiasco. However, the OAS’s member states found an easy way to address the Honduran crisis without actually respecting the organization’s democratic principles. After all, are elections enough to guaranty democracy, if there is little participation and a boycott of the former elected president’s political party? The response lies in the initial actions of the newly-elected President Porfirio Lobo Sosa: to provide an amnesty to the golpistas and to “invite” the former elected president Zelaya back from exile in the Dominican Republic. In fact, this inability for the OAS to do more is easily explained by the member states positions: the OAS does what the majority wants. Thanks to article 20 and 21 of the Democratic Charter, the General Secretary could have condemned the coup, suspended Honduras from the OAS, and promoted dialogue through negotiations, but because of the intransigence of the dictatorship, the organization could not do anything more unless the member states chose to do so. A similar situation arises during the crisis in Venezuela in 2002. The OAS was very slow to condemn the coup, and reacted only after elected President Chávez was returned to office in 2002. The OAS never formally condemned the coup plotters (the opposition’s political party) as they broke with the country’s democratic process, and instead the OAS asked for negotiation between an asymmetrically elected president and the golpistas. Moreover, even though the subsequent elections were certified by major agencies like the United Nations Program for Development (UNDP), the OAS itself, the Carter Center, as well as Venezuela’s Electoral National Council (CNE, Consejo Nacional Electoral), the opposition leaders never recognized it, leading to continuous political tensions and bi-polarization in the country. Could the OAS have done more? Divided between a U.S. led-bloc willing to oust Chávez and the other Western Hemisphere governments insisting that the legitimacy of the Venezuelan elections was fully apparent, there was no common position and the hands of the OAS were tied. During the crisis in Venezuela in 2014, even if the U.S., Panamanian, and Canadian governments wanted to do more to interfere in Venezuela’s local situation and use the Democratic Charter to promote a more energetic and interventionist active policy, 29 member states chose to vote in favor of a resolution supporting the elected government of President Nicolas Maduro. Again, the statue-quo was the only response provided by the OAS, because of the opposition between member states. The failure of the OAS lies in part to Cuba’s refusal to reintegrate into the Organization as well as its incapacity to effectively promote dialogue and cooperation among the Americas. 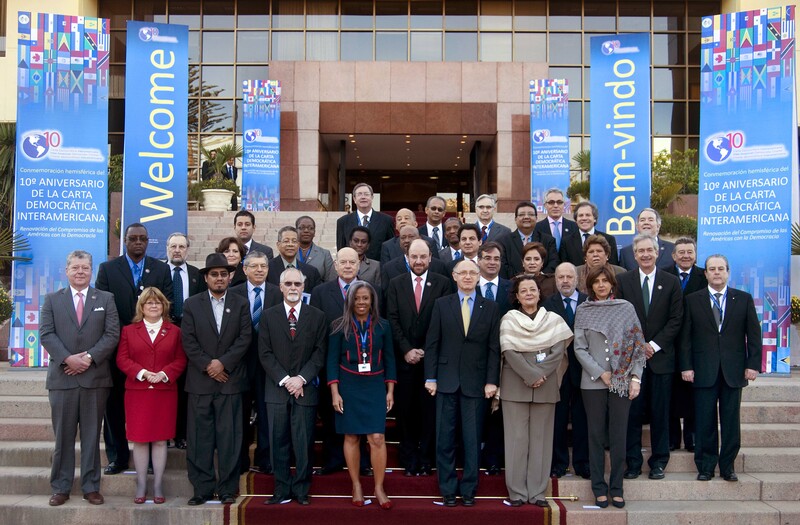 Due to the U.S. and Canadian government’s preeminence in the OAS, Latin American countries have given preference to creating other regional agencies, such as the ALBA or the Community of Latin American and Caribbean States (CELAC, Comunidad de Estados Latinoamericanos y del Caribe), where none of whom had membership. The latter is a hemispheric political forum, which has as members all Western Hemisphere nations except the U.S. and Canada as well as the South American Nations Union (UNASUR, Union de las Naciones Sur-Americanas) another regional body that includes every South American countries, dealing to the South American problems, leading to a weakening of the OAS. The OAS as a political entity has been declining in recent years, even though its leadership has improved. The OAS is suffering from the bind between Hugo Chávez’s vision of the OAS as a “puppet of the U.S. government” and the point of view for U.S. Republicans, and while threatening defunding of the OAS, because it has become an “enemy of democracy.” The lack of participation from every hemispheric nation is another issue for members of the OAS. As we have seen, every State favors a different regional mechanism, and strategy to shine on the international stage in order to promote international cooperation, even if the majority of Latin American governments are looking to record for more distance from the U.S. government. Brazil, for example, focuses on South American policies through the Union of South American Nations (Unión de las Naciones Sur Americanas,UNASUR), the Banco del Sur development bank, its own national development Bank (the BNDES, Banco Nacional de Desenvolvimento Econômico e Social), and the economic integration mechanism compatible to the Common South Market Common South Market (Mercosur, Mercado Comun del Sur). Meanwhile, Venezuela, Ecuador, Bolivia, Nicaragua, and Cuba, among others, prefer the ALBA and act as a bloc in forums like the OAS. At the end of 2014, there are greater calls for a major overhaul of the OAS. The Ecuadorian Ambassador to the OAS, Marco Albuja, advocated in October 2013 for political reform in order to end the political and economic dependence to Washington throughout Latin America and the Caribbean. Even though the OAS has been the faithful watchdog for the Americas for decades, even Washington wants to see reform. Case in point, in 2013, the U.S. Congress adopted a bill on the “revitalization and political reform of the OAS” asking for the Secretary of State to more aggressively promote more human rights, the rule of law, and the respect of Inter-American democratic tools. Since its creation, the OAS has designed important initiatives to protect and uphold democracy in the Americas such as the Democratic Charter, but internal problems, national interests and the disconformities of the Inter-American system have prevented this entity from being a major vehicle and a completely impartial player in hemispheric affairs. The OAS continues to struggle with some of the region’s fundamental internal problems caused by an aggressive and violent U.S. foreign policy towards Latin America going back half a century. The lack of will from member states to effectively discuss and promote common positions of all the Americas. ARRIGHI Jean-Michel, Max Planck Encyclopedia of Public International Law (MPEPIL), October 2010. The information regarding the Pact of Bogota can be found on the OAS Department of Law website on http://www.oas.org/juridico/english/sigs/a-42.html consulted on November 6, 2014. For more details about center-periphery theories, here are some references: FURTADO Celso, Dialetica do desenvolvimento. RJ, Fundo de Cultura and FURTADO Celso, Uma economia dependente. RJ, Ministerio da Educacao e Cultura, 1956. GALEANO Eduardo, Las venas abiertas de America Latina, Essai Pocket, 2011. SUAREZ SALAZAR Luis, Las relaciones interamericanas: continuidades y cambios, CLACSO, 2008. The complete Declaration can be consulted on the OAS website on http://www.oas.org/juridico/spanish/tratados/b-29.html consulted on November 6, 2014. The complete document of the Inter-American Treaty of Reciprocal Assistance is available on the OAS website on http://www.oas.org/juridico/english/Treaties/b-29.html. Consulted on November 18, 2014. BRICE Arthur, “OAS lifts 47-year-old suspension of Cuba” in CNN, on http://www.cnn.com/2009/WORLD/americas/06/03/cuba.oas/index.html?_s=PM:WORLD consulted on November 18, 2014. Hinchey Report, CIA Activities in Chile. September 18, 2000. and GUSTASFON, Kristian C. (2002). “CIA Machinations in Chile in 1970”. Retrieved 2008-06-21. For references about these dictatorships, you can look into Larsen, Neil (2010). “Thoughts on Violence and Modernity”. In Grandin, Greg. A Century of Revolution: Insurgent & Counterinsurgent violence during Latin America’s long cold war. Durham & London: Duke University Press. pp. 381, 391. ; Larsen, Neil (2010). “Thoughts on Violence and Modernity”. In Grandin, Greg. A Century of Revolution: Insurgent & Counterinsurgent violence during Latin America’s long cold war. Durham & London: Duke University Press. pp. 381, 391. ; R.M. Koster and Guillermo Sánchez, In the Time of Tyrants, Panama: 1968-1990. (NY and London: W.W. Norton and Company, 1990), Ch. 4. ; Diana Jean Schemo (16 August 2006). Stroessner, Paraguay’s Enduring Dictator, Dies. The New York Times. Retrieved 3 July 2014. ; Feitlowitz, Marguerite (1998). A Lexicon of Terror. New York: Oxford University Press. ; Gould, Jeffrey (2010). Grandin, Greg, & Joseph, Gilbert M., ed. On the Road to “El Porvenir”. Duke University Press. pp. 87–120. ; MOULIAN Tomás, Contradicciones del desarrollo político chileno, 1920-1990, Santiago de Chile: LOM ediciones, 2009 ; MDeConde, Alexander et al., ed. (2001). “Dictatorships”. Encyclopedia of American Foreign Policy, Volume 1. Simon & Schuster. p. 499. MARIANO, Nilson. As Garras do Condor, São Paulo: Vozes, 2003, p. 234. LEE Brianna “The Organization of American States”, on Council for Foreign Relations (CFR), April 13, 2012. t is also interesting to note that the American Declaration on the Rights and Duties of Man, adopted months earlier than the Universal Declaration, underscored the region’s commitment to international protection of human rights and paved the way for the subsequent adoption of the American Convention on Human Rights (“Pact of San José,” Costa Rica) in 1969 (entered into force in 1978), which highlighted the contradictions of the Inter American System. While the OAS officially promoted human rights, the US government installed and supported dictatorships all over Americas while the OAS remained passive. ALBAN GUEVARA Rodolfo, “Civil Society and the Protection of Democracy in the Americas”, FOCAL, May 2006. The list of the OAS peace mission can be found on http://www.oas.org/sap/peacefund/PeaceMissions/. Accessed on November 6, 2014. GAVIRIA C. “La OEA en transición 1994-2004. Democracia” organización de los Estados Americanos, 2004. Available on http://oas.org/documents/eng/Gaviria2004/01_Democracy.pdf consulted the 28th of October 2014.The complete declaration can be consulted on http://www.oas.org/xxxiiiga/english/docs/agdoc4224_03rev3.pdf Accessed on November 6, 2014. GRAHAM J. W. “A Magna Carta for the Americas, the Inter-American Charter: Genesis, Challenges, and Canadian Connections”. Fundacion Canadiense para las Americas (FOCAL). Consulted on: http://www.focal.ca/pdf/iad_charter.pdf the 28th of Octuber 2014 and GRAHAM J. W. “The venezuelan fiasco: should we care?”. Fundacion Canadiense para las Americas (FOCAL). Consulted on http://www.focal.ca/pdf/venezuelan_fiasco.pdf the 28th of Octuber 2014. GAVIRIA C. “La OEA en transición 1994-2004. Democracia” Organización de los Estados Americanos, 2004. Available on http://oas.org/documents/eng/Gaviria2004/01_Democracy.pdf consulted the 28th of October 2014. VIGNA Anne, “Transition antidémocratique, Au Honduras, comment blanchir un coup d’Etat?” in Le Monde Diplomatique, January 2010. Consulted on http://www.monde-diplomatique.fr/2010/01/VIGNA/18710 on November 17, 2014. Regarding this question, the US Secretary of State propose in 2014 to apply the Democratic Charter to violent protests in Venezuela against Venezuelan elected government. WEISBROT Mark “The truth about Venezuela: a revolt of the well-off, not a ‘terror campaign’”, The Guardian, March 20, 2014. MORALES Hector “Cuba hasn’t been given a free pass” in Americas Quaterly, fall 2009. Consulted on www.americasquaterly.org/OAS-cuba-readmit the 28th of October 2014. WEISBROT Mark “The truth about Venezuela: a revolt of the well-off, not a ‘terror campaig’”, The Guardian, March 20, 2014. MEZA SALAZAR Sergio, “La democracia y el Sistema Interamericano: de la Carta de la OEA a la Carta Democrática lnteramericana”, Agenda Internacional Año VII, N” 16, 2002, pp. 97-122. WEISBROT Mark “The truth about Venezuela: a revolt of the well-off, not a ‘terror campaig’”, The Guardian, March 20, 2014. The entire Resolution entitled “Solidarity and Support for Democratic Institutions, Dialogue, and Peace in the Bolivarian Republic of Venezuela” can be found on http://www.oas.org/en/media_center/press_release.asp?sCodigo=E-084/14 accessed on November 6, 2014. LEE Brianna“The Organization of American States”, on Council for Foreign Relations (CFR), April 13, 2012. ; BBC “Colombia takes Venezuela rebel accusation to OAS” on BBC News, July 18, 2010. http://www.bbc.co.uk/news/world-latin-america-10674859 ; ROGIN Josh “House panel votes to defund the OAS” in Foreign Policy, July 20, 2011..
 “Ecuador pidió reformar la OEA para terminar con el tutelaje político y económico de los Estados Unidos” in Telam on October 10 2013.